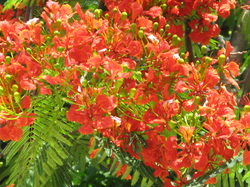 ชื่อสามัญ Flambuoyant Tree , Flame Tree , Peacock Flower , Royal Poicaina. ชื่อวิทยาศาสตร์ Delonix regia (Bojer ex Hook.) Raf.